This is the first page of Coin Value Tables for US Peace Dollars. The Tables illustrate Peace Dollar prices and their trends since 1950 for all coins of the series. The objective is to show collectors the Peace Dollars which have displayed the strongest price advancements over time. The Tables also estimate current values for any Peace Dollar coin. 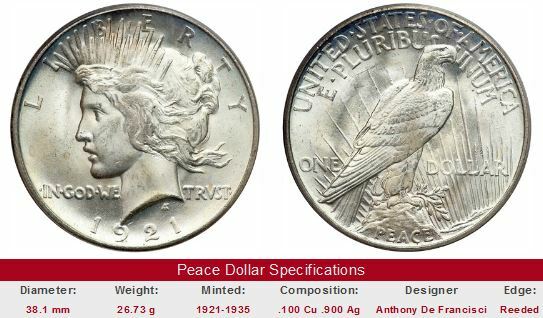 The links directly below are to help you quickly locate Peace Dollar prices for specific dates of interest. There is one table for each and every date, covering a range of grades. The Peace Dollar key dates are the 1921 and 1928. As the Tables demonstrate, these dates increase more steadily in value than common dates. This beautiful coin has long been widely acclaimed as one of the greatest artistic successes in all of American numismatics, which in large part, explains their popularity with today's collectors. Don't think of the Peace Dollar merely as some kind of investment tool, because you'll cheat yourself out of the joy of owning one. A good place to learn about the coin and its origin is found at the US Peace Dollar introductory page. Other online US coin value trend reports can be found on the Coin Value Tables main page. These other trend reports can also be accessed by clicking "Get Historic US Coin Values", located in the upper right hand corner of this page. The Coin Value Tables™ trend data for Peace dollars reflect the historic availability of numeric grades to describe coins. For the 1950-1985 rows, the values in the "F-12" column correspond to the "Fine" listing of those years, "VF-20" corresponds to "Very Fine", and so on. The "MS-60" column records the "Uncirculated" value reported during those same decades. Similarly, "PF-65" corresponds to simple "Proof" figures. Starting in the 1980 row, coin values strictly correspond to numeric grades grades. Furthermore, "Uncirculated" grades are broken down with greater specificity beginning in 1980, because by then, this type of value data for Peace dollars was becoming more readily available. Today, many gradations between 60 and 70 are routinely reported on.